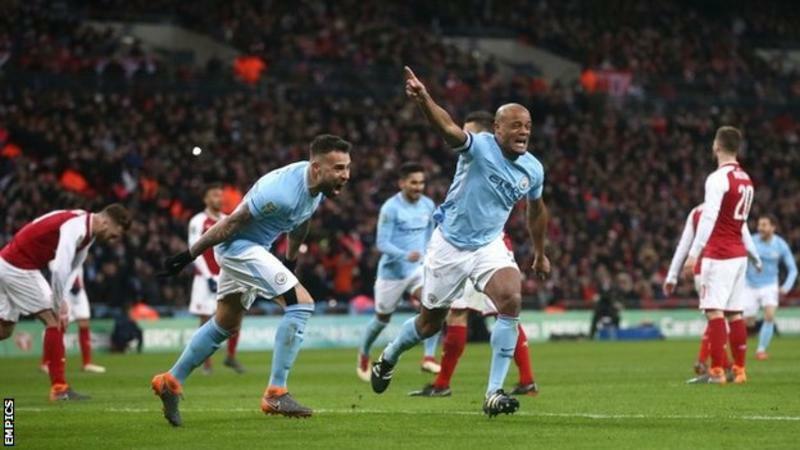 Runaway Premier League leaders Manchester City, arguably the best team in Europe right now, have won English football's first silverware of the season by brushing aside London giants Arsenal in the Carabao Cup Final. 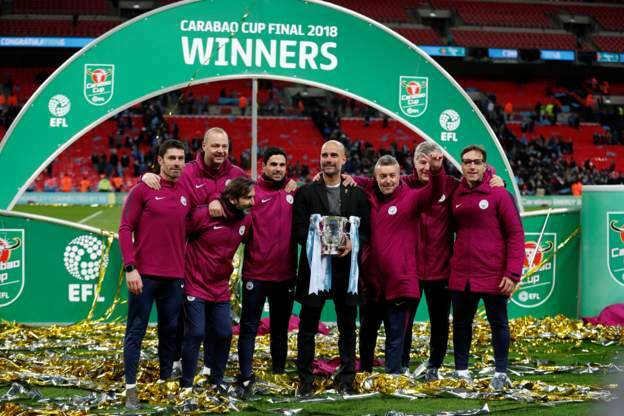 Manchester City won their first trophy under Pep Guardiola as they brushed aside Arsenal in the Carabao Cup final at Wembley. Sergio Aguero took advantage of some poor Shkodran Mustafi defending to latch on to Claudio Bravo's goal-kick and lob David Ospina for the opener. Captain Vincent Kompany diverted home Ilkay Gundogan's shot to double their lead. And David Silva added the third when he smashed home from Danilo's pass. The Gunners were as poor as the scoreline suggests and their best chance came at 0-0 but Pierre-Emerick Aubameyang's close-range effort was at Bravo. The League Cup remains the only domestic trophy Arsene Wenger has not won at Arsenal, losing in the final for the third time in his 21-year reign. Guardiola, whose side are 13 points clear at the top of the Premier League, again wore the yellow ribbon to support jailed Catalan politicians that has landed him in trouble with the Football Association. In his second season at City, he can now add the League Cup to the 21 trophies he won as boss of Barcelona and Bayern Munich. The 31-year-old Belgian was the mainstay and leader of the Manchester City side who claimed Premier League titles under Roberto Mancini and Manuel Pellegrini in 2012 and 2014 - but has waged a relentless battle against injuries in recent seasons. This term he has played in 13 out of 43 games but chose the Wembley stage to demonstrate exactly what he can still mean to Guardiola and City as they now move on to close out the formalities of another title triumph and continue their pursuit of the Champions League. Kompany was at his imperious best, matching Aubameyang in a first-half race before brushing the Arsenal striker aside to snuff out a rare moment of danger. Kompany celebrated like a man who has known the long, lonely hours searching for full fitness and was enjoying a moment of sweet elation. He led from the back and at the front in a consummate performance. This was the sort of day Manchester City's owners had in mind when they finally brought Guardiola to Etihad Stadium - watching their side dominating at Wembley to secure his first trophy in England. And while the 47-year-old has brought impetus, ideas and fresh young faces to City in the shape of forwards Leroy Sane and Gabriel Jesus, he has been careful to maintain and nurture the experienced heart of the side that brought the club's years in the wilderness to an end. 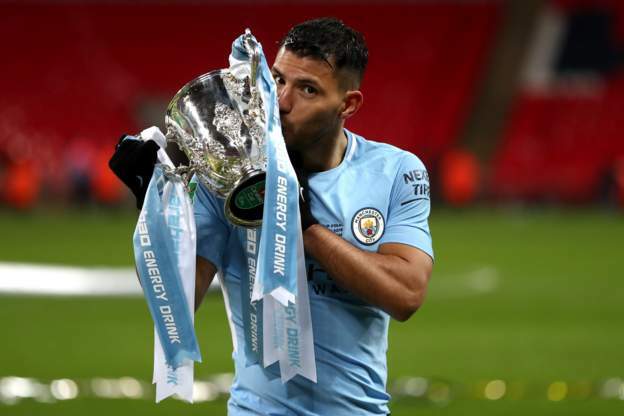 As well as Kompany, this EFL Cup victory was shaped by the predatory instincts of Aguero, still a world-class striker at 29. The Argentine set City on their way with his usual expertise as he took full advantage of flimsy defending from Arsenal's Mustafi. And it was another member of the old guard, 32-year-old Silva, who provided his usual range of subtlety and creation in midfield, completing the win with a thumping finish across Ospina. Guardiola's first silverware in England ushers in the new era for City - but he has wisely retained the battle-hardened core of the club's previous successes. Manchester City's 3-0 win over Arsenal is their biggest ever cup final victory, as well as the Gunners' biggest ever loss in a cup final. Manchester City have won the League Cup for a fifth time - only Liverpool (eight) have won it more often. Arsenal have lost six of their eight League Cup finals, including each of their last three. 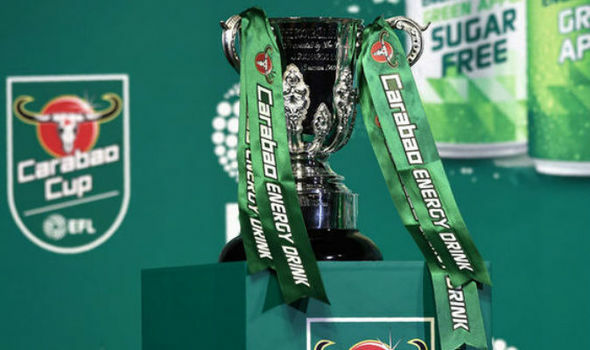 The Gunners are the first side to lose in three successive appearances in the League Cup final (2007, 2011 and 2018 ). City are one of four sides to lift the trophy on four successive League Cup final visits (Aston Villa, Liverpool and Manchester United). No manager has lost more League Cup finals than Arsene Wenger (in 2007, 2011 and 2018 ), level with Sir Alex Ferguson, who also won the trophy four times. Pep Guardiola has triumphed in seven of his previous eight major domestic and European finals, losing only to Real Madrid with Barcelona in the 2011 Copa del Rey final. Sergio Aguero has scored in each of his last five games against Arsenal. He has scored 15 goals in 13 appearances in 2018 - more than any other player in the top five European leagues. This was the biggest win by a Premier League team against another in a League Cup final since 2006 (Manchester United 4-0 Wigan Athletic), and biggest in a League Cup final at Wembley since 1996 (Aston Villa 3-0 Leeds United). Both sides meet again in the Premier League on Thursday at Emirates Stadium (19:45 GMT). City then host Chelsea on Sunday (16:00), with Arsenal at Brighton earlier in the day (13:30). Last edited by Blackleaf; Feb 25th, 2018 at 02:34 PM.. This Cup + CL + maybe FA but not the english league. I saw a great movie last weekend. It was a documentary about the creation of Man.U. called "Early Man". Chelseas newest team are pure interests. Manchester City are 13 points clear at the top of the Premier League with a game in hand (away against Stoke City tomorrow night). They're a cert to win the title. 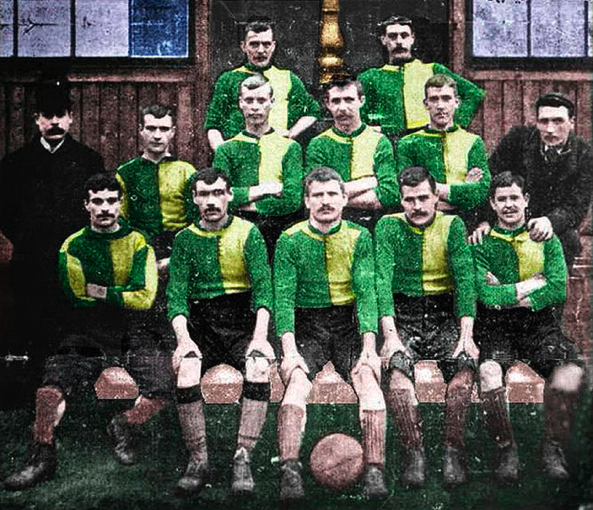 Manchester United was formed in 1878 as Newton Heath Lancashire and Yorkshire Railway Football Club by the Carriage and Wagon department of the Lancashire and Yorkshire Railway depot at Newton Heath, Manchester. They wore yellow and green shirts. They changed their name to the famous Manchester United in 1902 and adopted those famous red shirts. Today, Manchester United is one of the most famous British brands around the world. They are the most successful English football club in history, having won a record 20 League titles, 12 FA Cups, 5 League Cups and a record 21 FA Community Shields. The club has also won three UEFA Champions Leagues/European Cups, one UEFA Europa League, one UEFA Cup Winners' Cup, one UEFA Super Cup, one Intercontinental Cup and one FIFA Club World Cup. In 1998–99, the club became the first in the history of English football to achieve the treble of the Premier League, the FA Cup and the UEFA Champions League. In 2016–17, by winning the UEFA Europa League, they became one of just five clubs to have won all three main UEFA club competitions. In addition, they became the only professional English club to have won every ongoing honour available to the first team that is organised by a national or international governing body. Today, Manchester United are the richest football club in the world. Manchester City, meanwhile, are the world's fifth-richest football club. Of the world's 20 richest football clubs, ten of them are English - Manchester United, Manchester City, Arsenal, Chelsea, Tottenham Hotspur, Liverpool, Leicester City, West Ham United, Southampton and Everton. As well as the two Premier League giants, Manchester is also home to another football club - F.C. United of Manchester. The club competes in the National League North, the sixth tier of the English football league system. 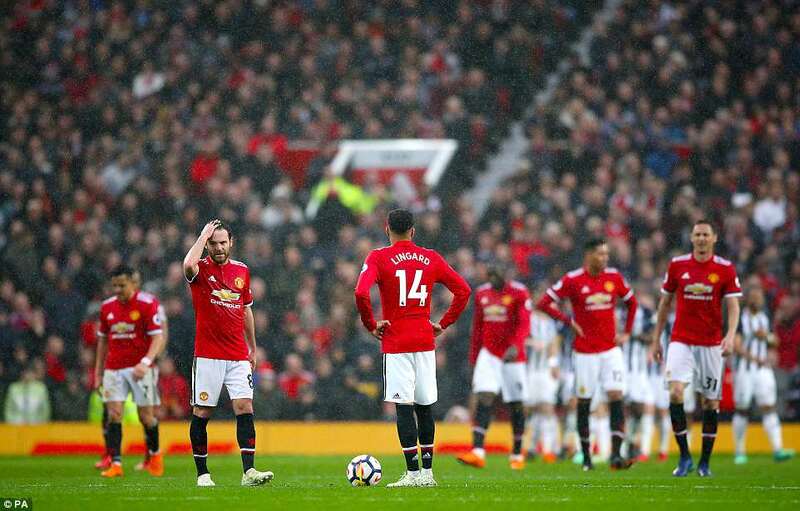 Last edited by Blackleaf; Mar 11th, 2018 at 11:26 AM..
Manchester City won the Premier League title as Manchester United's shock 1-0 home defeat by bottom club West Bromwich Albion confirmed their rivals as champions. It is City's third title in seven seasons and a first under Pep Guardiola in his second campaign in charge. 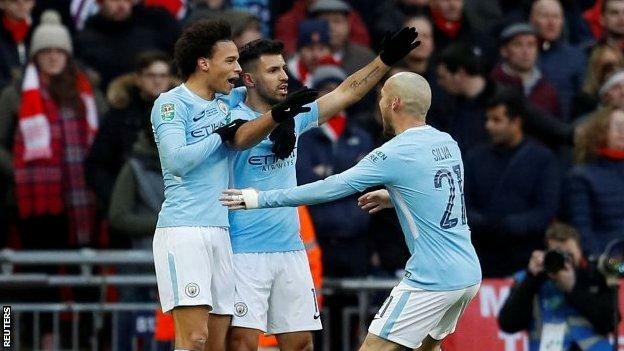 It is Manchester City's third title in seven years and fifth top-flight title. The Premier League title is the 24th trophy of the former Barcelona and Bayern Munich boss's managerial career. Last edited by Blackleaf; Apr 15th, 2018 at 01:02 PM..